Fast growing composite door manufacturer, DOORCO has launched a new corporate video, allowing customers and prospective customers the opportunity to see for themselves the manufacturing process which takes place behind the scenes, both at DOORCO UK and Korea, to produce the innovative designs that are delivered to their door. Managing Director, Dan Sullivan explains: “Product quality and innovation are key to our fully automated operation at DOORCO, and our unique status as global manufacturers allows us to effectively achieve both on behalf of our customers, allowing them access to fast decision-making, and input into product development. The new video details perfectly how this is achieved, demonstrating GRP skin production and door assembly, including trimming, sizing and foam core injection in Korea; and custom sizing, CNC cutting, edging and despatch in the UK – not to mention the add-ons such as glazing and painting of the doors, which can be customised. “As well as a great way for key customers to see for themselves how we operate as a manufacturer, the video also supports the greater emphasis we have placed on our marketing and promotional activities. We invested last year in refreshing our website to produce the bright, modern and user intuitive site you see today, in parallel with a greater social media presence, and the future will see continued investment across all areas of the business. These include further developments to the website and improvements to our already impressive online ordering system; and on a physical level, further improvements to the shop floor. Meet the manufacturers yourself and take a look at the new video on DOORCO’s YouTube channel, DOORCO Ltd. 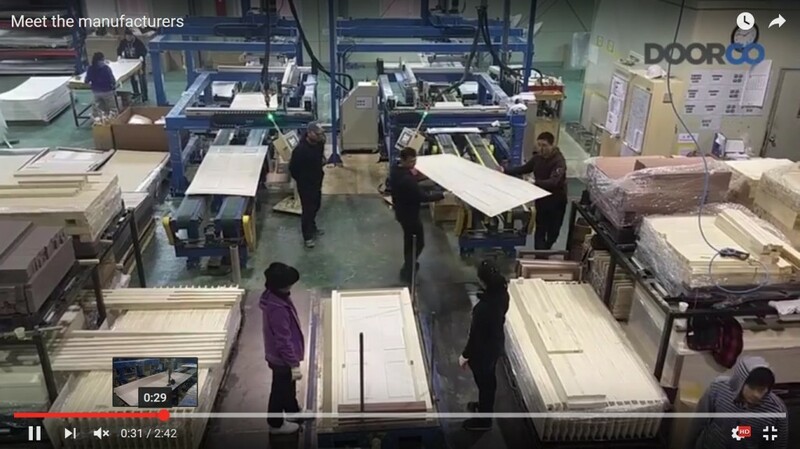 In an exclusive interview, Glass News’ Editor, Chris Champion, talks with DOORCO’s Dan Sullivan, CEO of DOORCO UK, and Yoonshin ‘Tony’ Cha, President and CEO of DOORCO Korea, at their stateof-the-art GRP composite door manufacturing facility in South Korea. GN: Dan, you are either an avid collector of air miles or have a ridiculous penchant for Korean Barbeques! In the last three years you have visited Korea literally hundreds of times and, often, week on week. Can we talk about how, and why, it was necessary for you to invest in building your own GRP composite door factory? Dan Sullivan: I do have a lot of air miles! My visits to Korea go back to around 2007 when I kept visiting Capstone to try and persuade them to provide me with a UK specification GRP doors. It was a long process and a matter of being both patient and persistent. Finally, when Mr Yoonshin Cha, the Vice President of Production for Capstone, was able to see me, I persuaded him to come to the UK and see the opportunity that existed. He recognised the opportunity: and the relationship between DOORCO and Capstone started. At that time it made sense to use the Capstone name to market their doors in the UK, as opposed to DOORCO. Yoonshin ‘Tony’ Cha: I should mention that when I finally met with Dan, after about 18 months of his visiting Capstone, I was surprised to know that most of my management and workers already knew him from all his visits to the factory! GN: Tony, can you explain the fact that you have partnered with Dan and now own DOORCO Korea? Yoonshin ‘Tony’ Cha: The Lehman Brothers bankruptcy in 2008, and the economic downturn that followed, meant that Capstone’s main market in the US was hit, severely. Rationalisation programmes were being talked about and the need for the Korean factory to find other markets while maintaining manufacture in China, concentrating on US specification doors. Having been responsible for building and developing both the Korean and China plants, I felt it was time for me to leave Capstone. Dan Sullivan: Meanwhile, I recognised that the composite door, generally, would come under more scrutiny as sales grew in the UK. I always thought the specification and quality of the door would need improving, plus we needed a factory focused on UK products and designs. All the other available suppliers were focused on other markets, mostly the USA, so the desire was to build a factory designed for UK demands, and have control of the supply chain. Tony and I had formed a close friendship during the years we worked together and I kept in touch with him after he had left Capstone and I floated the idea of setting up our own manufacturing facility. GN: That must have been a huge decision – being prepared to move from a vast company like Capstone, part of the Trinity Glass empire, to making your own doors. How could you expect to achieve that successfully? Yoonshin ‘Tony’ Cha: Having read Mechanical Engineering at University I went to the US to Graduate School and then joined LG selling injection moulding machines. I did this as a Sales Manager throughout the USA, Australia, India and South Africa for around 7 years. I then joined Trinity Glass as a Project Manager based in Seattle and, when Trinity, who were supplying Home Depot in the US with glass, was asked to takeover being the supplier of GRP composite doors if they could guarantee to have prototypes within 6 months, I was charged with setting up the Korean factory. Within the 6 months we were producing 1,500 doors per week and I was then asked to set up a factory in China with 20 presses producing 3,000 doors per week. Dan Sullivan: With Tony’s experience of production and with Hyun Sik on board, a chemist and expert in Sheet Mould Compound who worked for both Sungil and Capstone in GRP production for 15 years, we had a team capable of producing very high quality product. Dan Sullivan: As you know, the factory is 2 hours south of Seoul. The reason for this is that we found a GRP factory that was producing roof vents and the owner, Mr Kim, was wanting to retire. This gave us an experienced work force used to working in GRP and, while Mr Kim’s business was purely for the domestic market, DOORCO Korea was going to be purely export – something that the Korean Development Board were very keen on. When we explained that in the first week of manufacture we would be exporting 10 containers, we had tremendous help with the planning and building issues! Yoonshin ‘Tony’ Cha: We have the capacity to make 900 door blanks per day, currently, and have the space to extend our lines as required. Technology has moved on such that modern 1000 tonne presses take up much less room and we already have seven. We have taken out as much hand operation as possible to give consistency to production. The gluing line is automated and, as you’ve seen, the foaming and trimming line is also fully automated with just one operative required to oversee foaming. Yoonshin ‘Tony’ Cha: Quality Assurance is key to our manufacture and those people aren’t just putting protective coverings on the doors….this is the final check before despatch. Of the 100 staff, 35% are employed on quality checking throughout the process and this is key. As Dan says, once he’s sold a door, he doesn’t want to see it again! Yoonshin ‘Tony’ Cha: It is imperative that our quality is maintained. We are very experienced in door production and source the highest quality materials. We pride ourselves that the polymer rails have the densest PVC content on the market such that if someone chooses not to edgeband the door, the finish is still smooth. Our finger jointed hardwood is specially sourced and is an integral part of the construction, not simply timber offcuts. The GRP skins are of a thickness that every door blank that leaves the factory is capable of achieving Secured By Design. Importantly, the door specification does not change. That is essential for Dan when he is supplying to his customers in the UK. Yoonshin ‘Tony’ Cha: Both Hyun and I have experienced manufacture with different companies and we are fully prepared to research other industries to keep pace with the development of technologies. In the case of painting the skins, you have seen the two paint lines and the care that is taken. The aim is to produce perfectly painted skins and we would rather reject a skin than a whole door, hence painting the skin first. GN: It is also clear from seeing the doors being readied for loading into containers that you are making a wide variety of door specifications – and I don’t mean door styles. Are these for specific customers? Yoonshin ‘Tony’ Cha: We have a ‘can do’ mentality. Some of our container customers require doors for a specific purpose or contract and you can see from the door blanks that some may have a timber edge finish, a smaller polymer rail or may be much higher than standard. If a customer wants a specific specification they are often surprised how quickly Dan can show them the prototype. 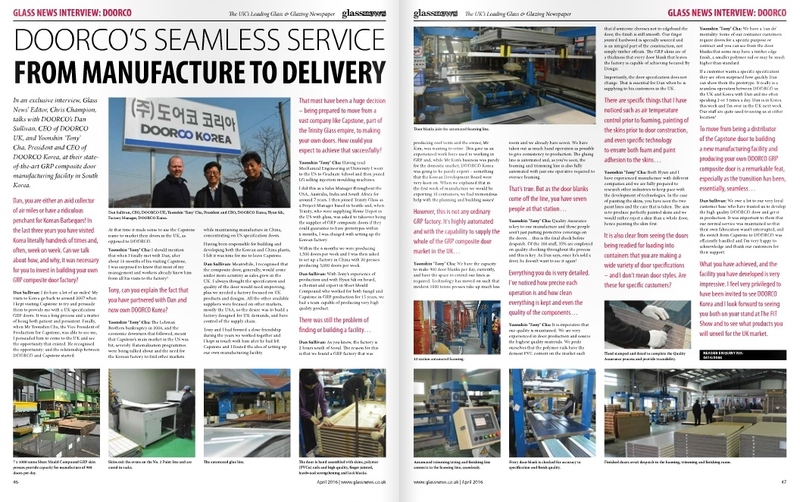 It really is a seamless operation between DOORCO in the UK and Korea with Dan and me often speaking 2 or 3 times a day. Dan is in Korea this week and I’m over in the UK next week. Our staff are quite used to seeing us at either location! Dan Sullivan: We owe a lot to our very loyal customer base who have trusted us to develop the high quality DOORCO door and get it in production. It was important to them that our normal service was maintained so that their own fabrication wasn’t interrupted, and the switch from Capstone to DOORCO was efficiently handled and I’m very happy to acknowledge and thank our customers for their support. GN: What you have achieved, and the facility you have developed is very impressive. I feel very privileged to have been invited to see DOORCO Korea and I look forward to seeing you both on your stand at The FIT Show and to see what products you will unveil for the UK market. 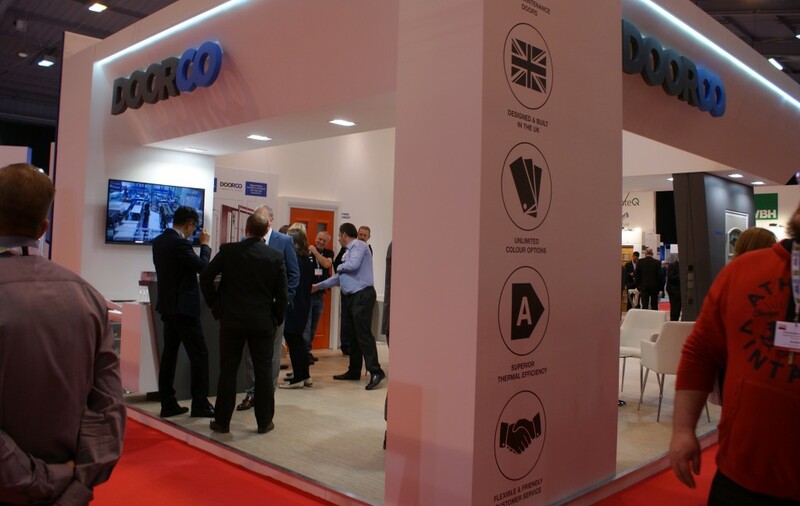 Fast growing composite door manufacturer, DOORCO is pleased to report a very successful FIT Show, which saw a consistently high volume of visitors to the stand, all eager to meet the manufacturers behind what is fast becoming the UK fabricator’s favourite door. Managing Director, Dan Sullivan comments: “FIT was a great show for DOORCO, we were busy on the stand right up until the end of the last day. We make no secret of the fact that we pride ourselves on leading the way in product quality and innovation, so it was good to hear visitors say that was the reason they came to see us. There was a lot of interest in all of the door designs on display, including The Combi and the Farmhouse, but what really stood out to the larger fabricators was our recently launched Smart Door, which is pre-apertured during manufacture to save CNC time, labour and wastage costs. “One new innovation, which is still in the R&D stage, is the hybrid concept, which we brought to the FIT Show in order to gain some all-important customer feedback. We’re confident that the door, which has a solid timber and foam core, is set to perfectly meet the demands of the retail market. Heavier and more substantial, it boasts fantastic thermal efficiency, won’t warp and uses GRP skins rather than PVC. 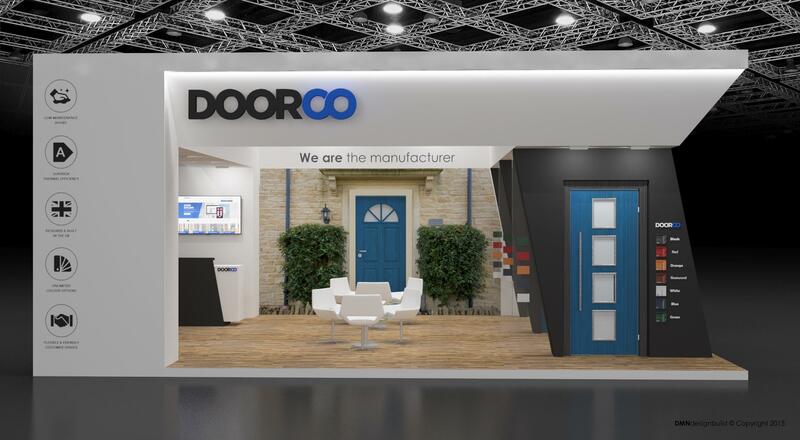 Fast growing composite door manufacturer, DOORCO is pleased to return to the FIT Show as an exhibitor, where the company will be showcasing, on Stand 242, a taster of some of its high quality, innovative designs and offering visitors the chance to meet the manufacturers behind what is fast becoming one of the UK’s fabricators’ favourite doors. Visitors to the stand can see for themselves the new Smart Door, which is pre-apertured during manufacture, therefore removing this layer from the fabricator’s processes, to save valuable CNC time, labour costs and wastage costs. Alongside this will be the popular Combi, with its unique midrail and woodgrain pattern running through from top to bottom, enabling the creation of seven styles from just one slab. Completing the trio of designs for 2016 is the Farmhouse, an upgrade on the Cottage, with the addition of a moulded design and reinforced skin for greater integrity over the original machine grooved flush door. But that’s not all visitors can expect on Stand 242, as Managing Director Dan Sullivan explains: “We’re looking forward to showcasing this latest suite of designs at the FIT Show, alongside just some of the other innovations from our range. But developing products such as these can only be achieved thanks to our status as manufacturers. We have a fantastic partnership with CEO Tony Cha and the team at the DOORCO Korea, in which we are shareholders. This means that workable ideas and suggestions can be processed quickly, with samples available almost immediately. Register for your free ticket to come and meet the manufacturers on Stand 242 at FIT: www.fitshow.co.uk/doorco/reg. At golf tournaments, Saturday is referred to as Moving Day, when players are jockeying for position on the leaderboard ready for an assault on the title on the Sunday. 2015 was one big moving day for DOORCO in one way or another and Chris Champion, Editor of Glass News talks to the Managing Director of DOORCO, Dan Sullivan, about the company’s move in the marketplace. Ed: The most significant move for DOORCO in 2015 has to be the new premises although product sales have been impressive, too. Dan Sullivan: The analogy of Moving Day is quite accurate. 2015 has been a great year but we all honestly think 2016 will be even better. We grew by 25% overall in 2015 and have budgeted for a 30% growth in 2016 although we all feel that may be pessimistic. Acquiring the new premises including warehousing, manufacturing area and offices all in one place, is ideal for us….and literally round the corner. Ed: The fact that it is still on Charter Way is amazing. How did that come about? Dan Sullivan: It was pure luck. We had been looking for some time and, one day, one of the girls came back from lunch saying that all the staff at the premises next door were out in the car park. My immediate thought was that they must have gone into administration and I walked round and asked one of the staff. That was exactly what had happened and I asked who the landlord was and I was pointed to a guy across the car park. He told me that the company had gone bust owing him rent and he was obviously pretty unhappy and I asked him if I could look around the place. He told me that the administrators were keeping everyone out. By the time I’d mentioned that I’d take a lease on the place if he could persuade the administrators to let us go inside, he’d sorted it and that was it. A new home for DOORCO! Ed: If there have been any negative comments over recent years about DOORCO, it has probably been about stock. Is the move to bigger premises all about remedying that? Dan Sullivan: There have certainly been occasions when we probably should have had larger stock holding – not to satisfy our own customer demands so much as to supply customers from rival companies who were short of stock themselves! We really haven’t required vast stockholding because, although doors blanks are coming from the Far East, our lead time is 5 weeks, not the normal 12 weeks for product from that part of the world. That difference in lead time has been very significant in that we really only need to hold 5 weeks stock at any time. Of course, in practice, we actually hold more than that and, with the new 40,000 sq ft, plus our other warehouse from where we top up our stock at Charter Way, we will hold 16,000 to 20,000 relevant blanks at any one time. When I say relevant, I mean that all stock is up to date and will pass any new PAS24 cutting test. There is also considerable volume of door blanks going to direct container customers. Dan Sullivan: I think that is down to a number of things. Our customers are our partners and we try to provide a great service, and they pay their bills! I know everyone will say this but in our case it is true. We deal with like-minded people. There is an honesty in our dealings which may be strange in this day and age but, fortunately, there are other people with the same standards as us…loyalty, honesty, enjoyment in working together and producing the best possible product for the market. The point is that we can react to change very quickly and I think it surprises customers when they make a suggestion or ask for something different and a sample is being flown in almost immediately. Dan Sullivan: The test is whatever it is, and DOORCO will ensure that the doors conform to that standard in the most cost effective way possible. If you are asking whether the test is realistic in this day and age and whether a prospective burglar would use those tools or choose to break in through a front door, the answer is probably no. But it is what it is and however a test may be changed, we shall always ensure that the DOORCO product conforms. Ed: Another ‘move’ is in the area of staffing. Last time I was here you had around 18 staff. That is up to around 30 now and includes your wife, Jayne, who has moved from a very senior director position with Ernst and Young, and Matt Le Mesurier who has had a lot of experience at DoorStop. Those two alone must have changed the dynamic in the company. Dan Sullivan: It has, and things have changed very quickly. It was a big decision for Jayne to leave a very high paid job and join DOORCO. Her experience of systems and procedures has improved the whole service offered to our customers and, with the company growing so rapidly, we needed a more professional and streamlined approach to take the company to the next level – we have taken steps to achieve this, but still have some way to go and this will continue to be one of Jayne’s key focus through the first half of 2016 with additional team members, more focus on customer service and new software investment across all areas of the business. In the case of Matt joining us in his Senior Production Manager role, that has been an eye opener! I thought that his experience at Doorstop would mean constant demands for more and better machines but it is just the opposite. He looks for efficiency in every manufacturing procedure and takes great pride in finding the best way of producing quality products without spending additional cash. Ed: The final ‘move’ is product. It seems you are constantly innovating and whenever I have visited DOORCO there has been new product under test. What drives this innovation? Dan Sullivan: It’s mostly me, I’m afraid! We have a tremendous relation with the factory in Korea and, if an idea comes to me or is suggested by a customer and it makes sense, then we’re straight on it. A good example is the Combi door which, by redesigning the tools for the GRP skins, we have been able to reduce stocking requirements for both us and our customers. One door design allows the combination of designs that used to require a 4 panel and 6 panel door. Additionally, the Smart door is a pre-apertured 4 panel door – in other words, routed to take twin vertical glazing. This reduces waste for us in our manufacturing of prepped doors and for our customers who have CNCs. People are inclined to forget the high costs of waste disposal and, added to that, the saving in tool costs and time, too. Ed: This re-engineering of tooling is costly. Surely it’s around £30K to £60K to produce a new tool? Dan Sullivan: In our case, it’s significantly more, as We produce very high quality tooling with long lifespan and very low degradation in definition of the graining. Again, this is something we have learned over the last 10 years. Our tools will produce in excess of 1 million door blanks. The high cost is down to the hand graining of the tools and this is key to performance. Not only does the grain need to look good, aesthetically, but the spread of the grain is what provides the keying for quality painting. Dan Sullivan: …which is about to be doubled in size! We can paint to any RAL colour – both here and in Korea. It has never been a case of just the standard colours of White, Black, Red, Blue, Green and a couple of Woodgrains. If a container customer wants all their door blanks in Canary Yellow, it’s not a problem. Equally, if a smaller customer wants a different colour for each of their prepped doors, we are happy to accommodate them. Dan Sullivan: As I said earlier, 2016 is a year when DOORCO will see big growth. We now have the premises, staff, the products, and the stock to expand our customer base. Even more new products will be launched and an additional edgebander is on order to add to our three CNCs. DOORCO has the best imported door blank in the UK and what we do in 2016 will reinforce that statement. If 2015 was Moving Day in your golfing analogy, then 2016 is the Sunday, and the day to win! Having experienced a huge increase in sales year-on-year, fast growing composite door manufacturer, DOORCO has now moved into new and much larger premises to facilitate further growth in the future. Renovation work completed on the 36,000 square foot facility, which is within a stone’s throw of the previous premises in Macclesfield, in early November, with machinery and equipment moved in, up and running in just 48 hours. This reinvestment in the business marks a major commitment to the UK market, and ensures that the company can continue to deliver what customers need to get ahead in this competitive sector. 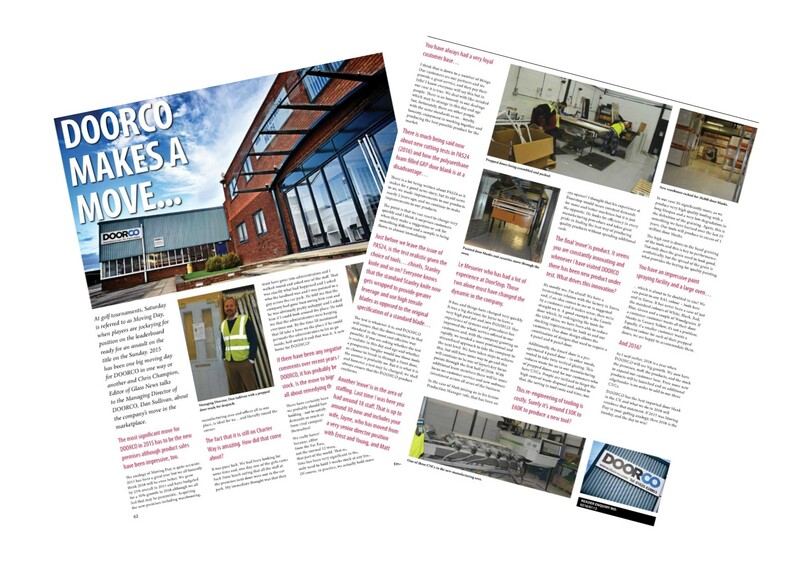 Jayne Sullivan, Operations Director at DOORCO explains: “We had searched for a long time to find a location which suited all of our requirements, and we’re delighted that the new facility in Macclesfield does just that. 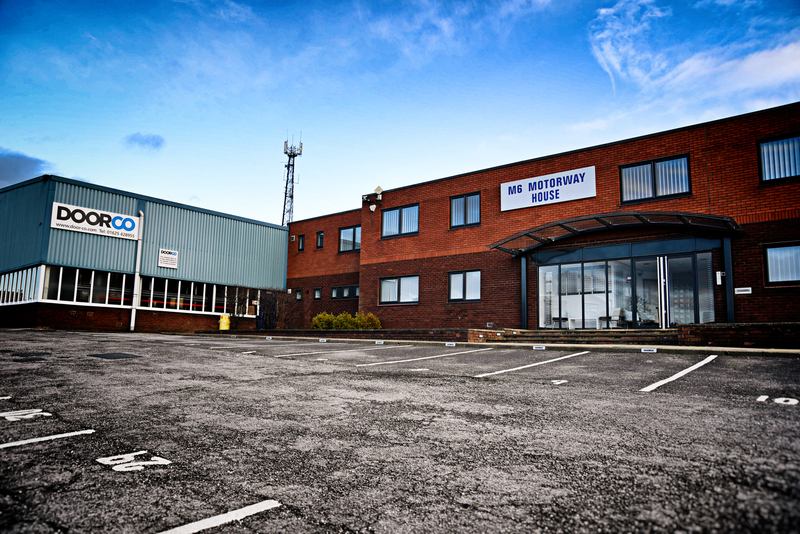 The new building provides a real opportunity for us to integrate our manufacturing and distribution divisions, which in turn provides greater flexibility for us as a business, as well as much needed space to future proof the company in line with the rapid growth and influx of big industry names coming on board that we have experienced. “As with everything we do, we put a great deal of detailed planning and hard work into the moving process to ensure it went as smoothly as possible in order to minimise any downtime for customers. We used a variety of local companies, all of whom worked together to very tight deadlines in order to get everything in and working as it should be. 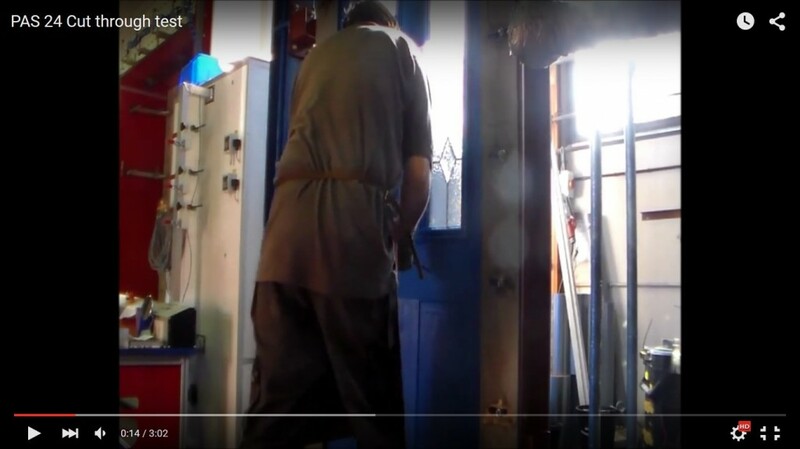 Fast growing composite door manufacturer, DOORCO, has been advising customers for some time that it was ready well ahead of the deadline for amends to Approved Document Q, and as further reassurance, the company is now pleased to share video footage which shows its door passing the PAS 24 cut test. DOORCO has long been prepared for the new and more rigid security standards, thanks to investment more than two years ago in the production of a new breed of composite doors – one of which (the Combi door) even allows multiple door styles to be created from one design. Crucially, this new breed incorporates significantly improved security features across the board which stand up to the new regulations, and stock was adjusted accordingly at the time to ensure that customers now receive the higher security door as standard. Dan Sullivan, Managing Director at DOORCO explains: “At DOORCO we not only pride ourselves on leading the way in product quality and innovation, but also customer service, and DOORCO customers know that we were prepared well in advance of October 1st. As additional reassurance – and in the name of openness and transparency – we now have the video evidence to prove it. View the video for yourself by clicking on the image above, or at: https://youtu.be/OWpZUlHeO8k. 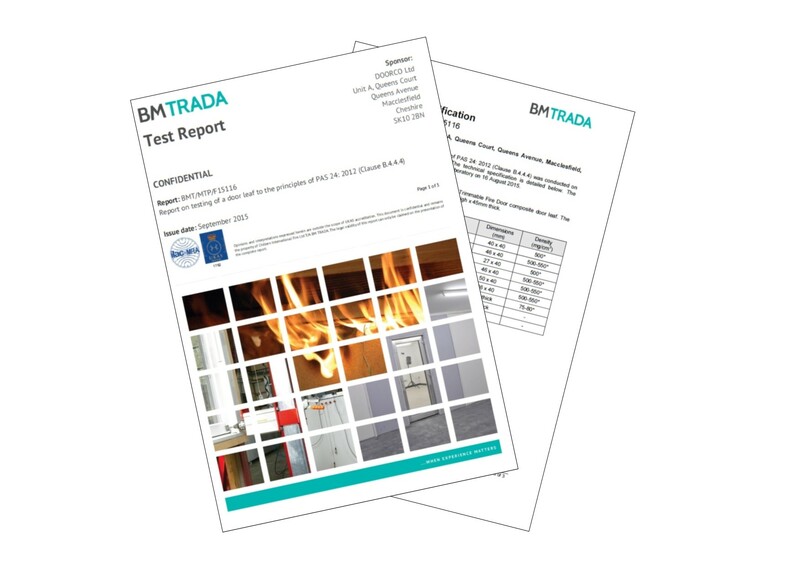 With the October deadline for Part Q compliance upon us, fast growing composite door manufacturer DOORCO is pleased to state that it has passed the latest round of security testing at BM TRADA with flying colours. Whilst the company is naturally delighted with the results, they came as no real surprise, as DOORCO has been ready for the amended standard for some time, following an investment programme more than two years ago which focused on the production of a new breed of composite door. This new door design provides ultimate flexibility for the customer as it enables multiple door styles to be created from one design, but crucially, it also incorporates improved security features which stand up to the new standards. Under the revised Part Q, either the PAS24:12 standard or Secured by Design accreditation covering the enhanced security of windows and doors becomes mandatory for anyone working on dwellings which are considered new build or conversion projects. Doors and windows must be able to resist physical attack by a casual or opportunist burglar in order to meet these standards. To do this they must be both robust and be fitted with appropriate hardware, which is true of the DOORCO range. 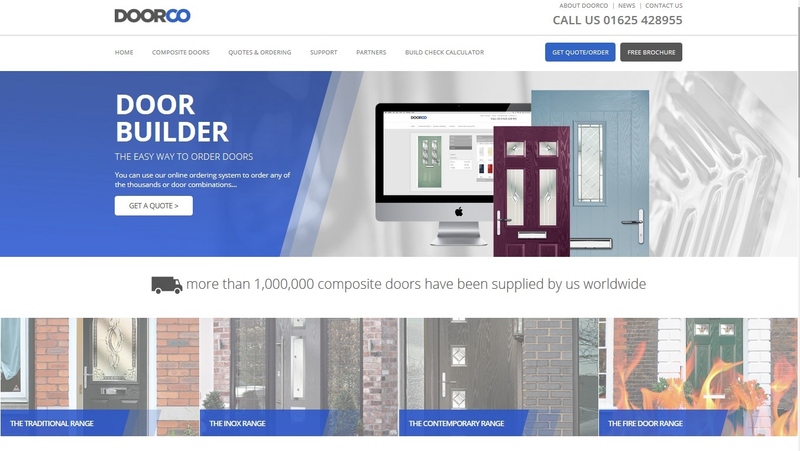 Fast growing composite door manufacturer DOORCO has now launched its eagerly awaited new website and upgraded its linked online ordering system. The combined website and ordering system provides the company’s resellers with an important resource through which to increase sales. It is a further indication of the company’s commitment to continually improving customer service. Creating the new website was a lengthy process, due to DOORCO’s continuous expansion of its product range with new styles and choices which were added throughout the website design process. The end result however is an exceptionally clear, bright and modern site and its simplicity encourage the user to delve deeper and explore more options. The News and Build Check Calculator are two other site facilities designed to provide support for DOORCO customers. The site is designed to provide a simple and effective ordering system for the company’s Prepped Slab trade customers whilst also providing them with a tool that helps to steer their homeowner customers through the design and selection process. Every one of DOORCO’s door ranges is featured using high quality professional images, together with style and colour options. The images used are also available for DOORCO customers to use in their own marketing. “DOORCO nominated The Consultancy as our website partners and we are delighted with the first version produced by their team,” said DOORCO’s Dan Sullivan. “There are a lot more ideas and development points that the Consultancy has suggested, so there will be a programme of advancement of the site over the next few months with their help. See the DOORCO web site and Online Ordering System at www.door-co.com. You can also follow us on twitter @DOORCO_Official or keep up to date with our Facebook Page at DOORCO Ltd.